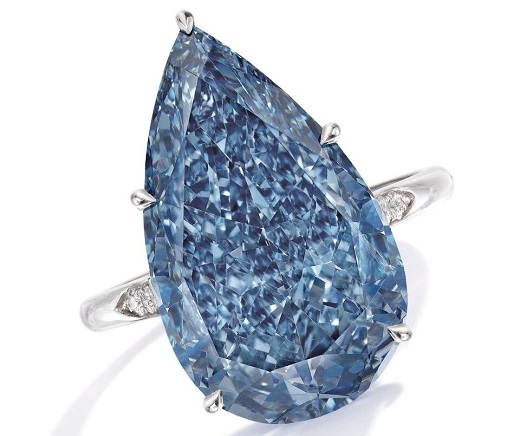 RAPAPORT... A blue diamond estimated at up to $30 million failed to find a buyer at Sotheby’s in New York on Tuesday. The pear-shaped, 10.62-carat, fancy-vivid-blue, VVS1-clarity diamond had a presale valuation of $20 million to $30 million. Another pear-shaped stone — a 2.76-carat, fancy-intense-purple-pink diamond — also remained unsold at the auction. It was estimated at $1.3 million to $1.6 million. Proceeds at the New York Magnificent Jewels auction came to $46.4 million. A collection of Barbara Sinatra’s jewels sold out, with a 20.60-carat, D-color, VVS1-clarity diamond engagement ring fetching $1.7 million, beating its presale estimate of $1 million to $1.5 million. Two Van Cleef & Arpels pieces belonging to the wife of legendary singer Frank Sinatra also sold: A pair of mystery-set ruby and diamond pendant earclips garnered $362,500, well above their estimate of $100,000 to $150,000, while a mystery-set ruby and diamond butterfly brooch went for $567,000, exceeding its valuation of $125,000 to $175,000. Other notable items at the sale included a cushion-cut, 51.52-carat, F-color, internally flawless Harry Winston diamond ring, which went for $4 million, or $77,154 per carat. The piece had a presale value of $3.5 million to $4.5 million. An emerald-cut, 25.03-carat, D-color, flawless diamond ring garnered $3.5 million ($139,632 per carat), compared to an estimate of $2.9 million to $3.5 million. “Our results demonstrate the timeless appeal of diamonds and continued appetite for exceptional colored gemstones and signed jewels from jewelry lovers and connoisseurs all over the world,” said Gary Schuler, chairman of Sotheby’s jewelry division in the Americas. A cut-cornered rectangular step-cut, 6.46-carat, fancy-orangey-pink, VVS2-clarity diamond achieved $206,656 per carat. The ring went for $1.3 million against its estimate of $600,000 to $800,000. Colored gemstones were also popular at the sale, as was the collection of Happy Rockefeller — philanthropist and wife of former US vice president Nelson Rockefeller — which sold out in full.